"You're going to France for 5 weeks!" "well I guess you know France by now"
Yes, but I am going to explore new places, ride new climbs, take new hikes, try new food. Meet new people. I have been to France before, my first time was in 1982, then 1995, 2001, 2003, 2005, 2007, 2008. I am going back in 2010 for 5 weeks. I am flying into Toulouse, I will be staying in Bedoin, Rocamadour, Arrens-Marsous, Biert, Crechetes, Guchan, Saint-Martin-le-Vieil, Saint-Mamet, Beaucens, Paris, and back to Toulouse. I am chasing the Tour de France for 8 of those days. I am going with my Scott CR1 Road Bike, 1 suitcase, an iPhone, a laptop, a bunch of maps, and a leased Renault Scenic (which will be used for 4 weeks prior by my brother and his wife). I intend to ride, hike, float, explore, work, rest, eat, drink, and be merry. France is a hard place to leave. In 2008 I did not want to leave France. I stood with my rental car return envelop hovering above the return slot for eight minutes on a dark morning in Pau. The techno music, from a nearby dance club, was blaring across the airport parking lot early in the morning, beating out a rhythm, as I rolled my bike box and suitcase into the terminal to that box where I now stood. I did not want to leave. Just the day before I had ridden up the Col d'Aspin to watch a stage of the Tour de France. I had met some incredibly fun lively friendly Brits near the summit. They made me a sandwich and entertained me for hours as we played in the onslaught of caravan trinkets, and awaited the pro riders. The entire day was amazing. I had looked forward to that day. I was going to the Tour de France - alone. But not really alone, I had the joy of riding my bike up the mountain next to a warm and funny French man who called out to everyone along the roadside as we ascended. I had decided I would ride to the summit and then descend until I heard "my language". I was not so much interested in my own Countryman, as much as my own language. After all one spends hours waiting along the road on a mountaintop route of the Tour de France. I couldn't have found a better group to spend the day with. They talked cycling just like me, they knew all the riders, the history, the local climbs, and they were hardy folk. 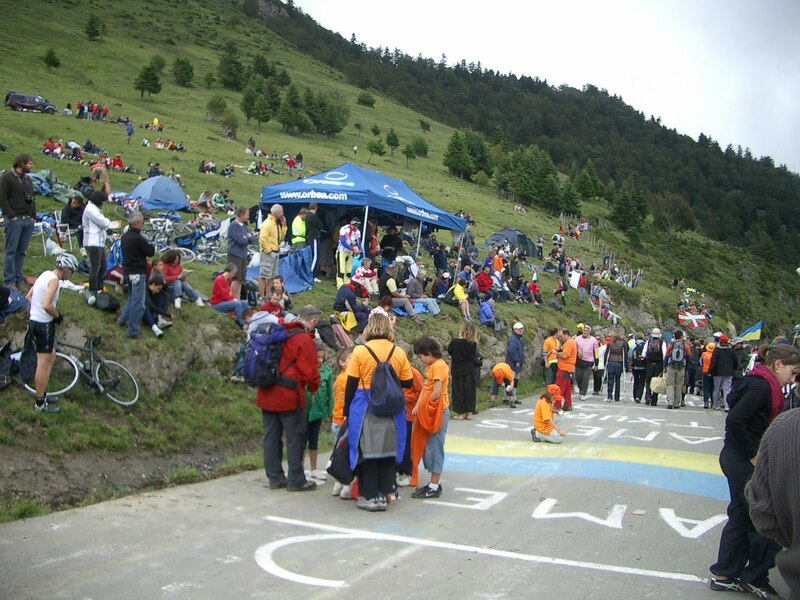 It was cold that day on the Col d'Aspin, yet the Brits filled the atmosphere with cheer. 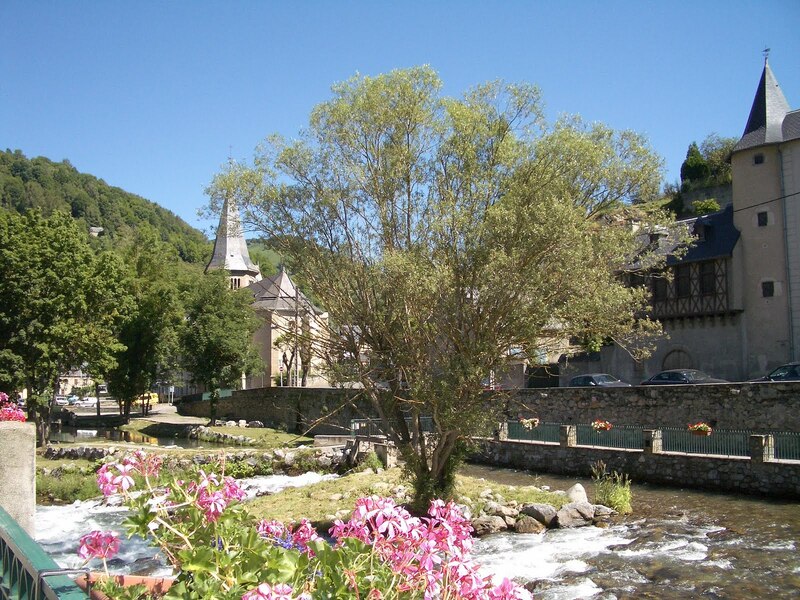 After the tour passed they invited me to ride down to the town of Arreau, "It will be quite the scene," Justin had said. I wish I had gone. I was going home to Colorado. I needed to drive back to Bielle, to pack my bike and bag, and get to the airport in Pau very early that next morning. Oh how I wish I had stayed. That is why I am going back. Every time I hear techno music it reminds me that I have a choice in all things I do. I think people repeat "5 weeks!?" back to me as if to say, I could never do that. Yes, you can. The same Justin who invited me to join the group for a beer that day, had himself been a banker in London and was now living in Saint-Lary-Soulan as a bike guide. My brother and his wife return to France yearly for 3-4 weeks. When I lived in Thailand and Indonesia, I learned that there are many many ways to live a life. Choice and diversity is what travel teaches me. And every so often I find a place that is hard to leave.